We walk the edge of the earth, an old friend and I. Her pace is painfully slow. It's not even a pace, really, more like just walking aimlessly, and I begin to wonder if I can do this: go slow. 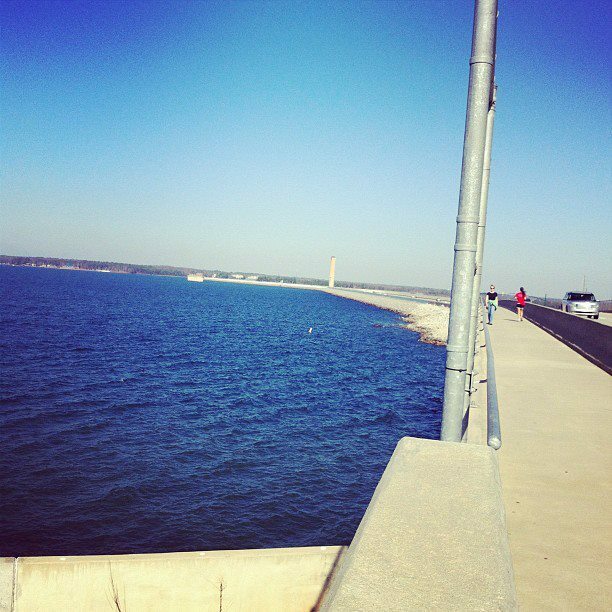 But the water below the dam laps like the Gulf of Mexico--the sound of home--and the shimmery sailboats wink in the sun. It's 70 degrees in January, and the conversation is sweet. So three hours and eight miles pass, and I've never walked that far all at once before. You can go farther when you go slow. It's Saturday, the day before the Daniel fast begins, and for days I have been weighing God's will and trying it on for size. Again. It's a dressing room decision, mulling over His will from every angle, studying the image of yourself wearing It in the mirror of your relationship with Him, and pretty sure It doesn't fit and you'll never wear It well. Usually, when I get far enough down on myself, I attack the enemy with a vengeance that lasts, say, ten days. That's when sore muscles and fatigue from too few calories get the better of me, and I ask for a truce with the food monsters within. My normal pace is frenetic. Eight miles with the smell of water in the air to learn that this time will have to be different from the 104 other times when I decided to do whatever it takes to beat the food issues. I've never tried slow before. You know what happens when you walk eight miles with a friend and enjoy catching up on each other's kids? You renew an old friendship. You also have sore hip flexors, you know, those muscles that don't get a good work out until you've walked a long distance. Vicki is training for next weekend's half-marathon. She's going to walk it. Sharing this in community with Jennifer at Getting Down With Jesus. Photo Credit: Rick: Cafeinated, used with permission. Oh ho! That was a real knock-out ending there, a big Aha! Hm, I guess slow must work! Hm. Thanks for this. (I really like walking -- but only ... slow! ;) May God continue giving you His wisdom through this month. I have trouble going slow, but God doesn't. Thank you. I'm inspired by your fast, Dawn. May God bless you along this journey in many unexpected ways -- as He did with renewing an old friendship. I loved that.